Apple announced the new MacBook today and it does the things differently in true Apple fashion. A lone USB-C port will handle the charging, data input and video out. So, how will the users recharge an iPhone and the laptop at the same time? Buy these adapters from Apple of course! A series of accessories for the USB-C port has been released. The users would need this $19 adapter in order to use a standard USB cable. USB-C Digital and VGA adapters, but cost $79 and they also add another USB-C port, a standard USB port and a VGA or HDMI output respectively. The new MacBook cannot directly recharge an iOS device without an adapter. 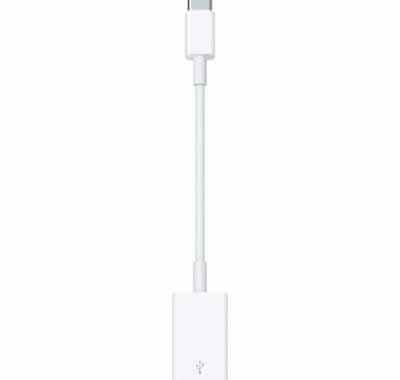 The users will have to plug the standard USB Lightning cable into the $19 USB adapter until the USB-C Lightning cable gets released. This is probably not the first time Apple has made changes without consulting the consumers. In 1998, the giant had launched the iMac G3 without a serial port or a floppy drive. Later on, Apple ditched Firewire ports and CD-ROM drives. Yet this latest move made by Apple is quite unique and different. Though the single port is simple and elegant, it truly ignores the needs of the customers. Isn’t it a crazy idea to expect a laptop to simultaneously recharge its batteries and output video or recharge another device?